you will get the phpmyadmin panels working. scoreDB.execSQL("CREATE TABLE IF NOT EXISTS " + HIGH_SCORE_TABLE + " ("
hope the code above will help. if the next instructions are Command Line related. The syntax above is to run the android manager and do some updates. installed via the android manager. 9. Your apk supposed to be in the emulator by this point. $ ./distribute -m "zope setuptools pkg_resources twisted"
and in my case it failed to build but we don't need it anyway. At this point i assume you are already successful to build twisted module. Python-for-android `distribute.sh -m ``kivy``` failed to build. $ ar rc libpython2.7.a Modules/threadmodule.o Modules/signalmodule.o Modules/posixmodule.o Modules/errnomodule.o Modules/pwdmodule.o Modules/_sre.o Modules/_codecsmodule.o Modules/zipimport.o Modules/symtablemodule.o Modules/arraymodule.o Modules/_math. `make -d` will throw alot of commands that being executed. Wow! Yes XUbuntu 14.04 deserved it. My Lenovo Ideapad Y450 Laptop had its wifi lock bit set. by software and did not switch it back on. I've been using Fedora for about 7 years. In Fedora 20, i have no idea to switch it back on. connect with cable therefor internet backs on! After using the Fedora 20 for a while i think my hardware had defected and leads to unstable operation. build and debug the chromium browser. showing 65356 (~65K) rows per worksheet/sheet. Are you having the same problem like me? then split the datas to 3 worksheets. each sheet then you will see that the sheets are succesful renamed or set to desired name. i come up with 39999 (~39K) rows max for each sheet. And everything works as expected. per sheet, all the data generated and shown as expected. ~65K rows for a workbook with a single worksheet. Hope this article would help. Just want to note what i just found a bug of CI 2.1.2 in system/library/Profiler.php. Where the $val is not evaluated to is_object and only expecting is_string() or is_array(). Adding validation is_object() would fixed the warning. very useful with the links. Keep coding. Migrating from Gnome3 to LXDE is so much fun! Experiencing lightweight desktop. But hitting my PrtSc resulting no respon... What? Argghh i have to added manually. Notice i am using paplay to play an *.ogg file. Fedora has this as default application. Browsing on the net returned me with Cinnamon as lightwright desktop, but hummm... wait. does not help to reduce the touchpad Tap sensitivity. Browsing.. aha! Use gpointing-device-settings! Run... select the tapping and disable. Problem solved and very happy with LXDE. All my applications are run smooth, the 7 frequently used mentioned before. Hi, just playing around and accidentally delete my ~/.config ~/.gnome and ~/.gnome2. All my settings are reset and my touchpad no longer be able to vertical edge scrolling. Googling with a little light pointing me to do $ man synaptics. me some of knowledge to set some of the synaptics properties. where the "1 1 0" meaning Vertical "on", Horizontal "on", Corner "off". thunderbird12: Fatal IO error 11 (Resource temporarily unavailable) on X server :0.0.
gnome-panel: Fatal IO error 0 (Success) on X server :0.0.
thunderbird12: Fatal IO error 2 (No such file or directory) on X server :0.0.
exe: Fatal IO error 11 (Resource temporarily unavailable) on X server :0.0.
exe: Fatal IO error 2 (No such file or directory) on X server :0.0.
gnome-power-manager: Fatal IO error 11 (Resource temporarily unavailable) on X server :0.0. 6. Expected result is after rebooting you are already be able to login and no more loop. Running USBAspLoader atmega8A-16PU with no problem. It was a very victorious moment. Since i am a newbie in micro-controller. Began with a little conversation in the electronic group. i encouraged myself to fork the source code at github and succeeded. 1. Clone or Download the code from the github. 4. Modify Makefile.inc if necessary to match-up your programmer. 5. Goto the directory above firmware directory. 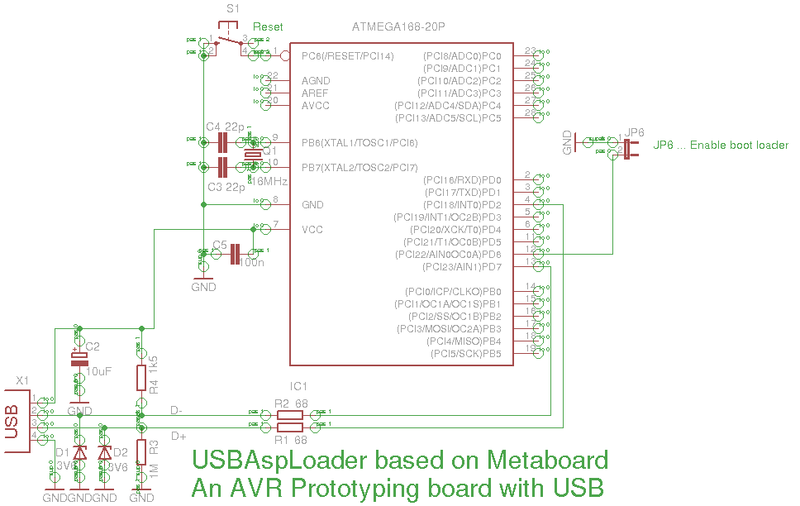 As you could noticed, the schematic is taken from metaboard and applies the same with Atmega16A. shows error that the manufacturer not found. It throw error that libssl.so.1.0.0 not found. I have made sure that OpenSSL is installed. Why it could not found the shared library. I found out that the Eagle CAD needs the libcrypto.so.1.0.0 too. Now it runs smoothly. Have fun! 3.11.10-200.fc19.x86_64 the modem-manager takes place and keep restarting my avr-cdc. I ended up stuck unable to upload any sketch to my arduino. After googling for about an hour to find proper way to disable the modem-manager, no luck. the kernel could not find the modem-manager application anymore.